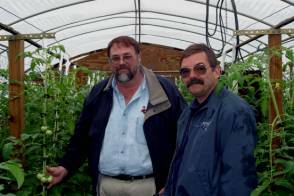 Contemporary tomato breeding programs focus on factors such as extended shelf-life, improved shipping ability, and disease resistance, while flavor often takes a low priority. The development of a better-tasting tomato with high quality and yield is a valuable production and marketing enterprise for North Carolina growers. Research has been initiated through the NC State Specialty Crops Program to identify cultural practices and cultivars that provide superior taste in our growing conditions. Preliminary results and recommendations for this ongoing project are shared in this report. 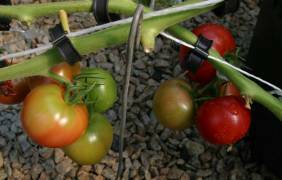 Crop production practices for both greenhouse and field tomatoes are well-established, and it is has been shown that tomato fruit quality can be improved by raising tomatoes at a high EC (see review of Dorais et al., Hort. Reviews, Vol 26, 2001). This research was proposed to investigate how practices can be modified to improve fruit quality without significant sacrifices in yield or fruit size. Although not all components of tomato flavor have been evaluated scientifically, high fruit quality is generally associated with a high EC, high Brix, low pH fruit. Definitions: Electrical Conductivity (EC) is a measure of the total salt content of water based on the flow of electrical current through the sample. The higher the salt content, the greater the flow of electrical current. 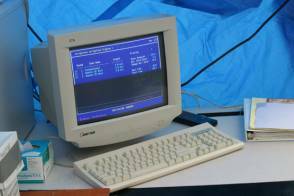 EC is measured in mho/cm, which is the opposite of ohms of electrical resistance. Since the conductivity of most water is very low, EC is generally reported in thousandths of a mho or millimhos/cc. (from the Texas Greenhouse Management Handbook, Department of Horticultural Science, Texas A&M University System). BRIX is a measure of the percent soluble solids in the plant juice. For most fruits, the soluble solids are mostly sugars. The concentration of soluble solids in the juice can be estimated with a refractometer. The refractometer measures the ability of a solution to bend or refract a light beam that is proportional to the solution’s concentration. Seed companies and individual breeders of both greenhouse and field tomatoes were contacted to aid in identifying relatively large (>100g) tomato cultivars with superior flavor. Most of these were cluster types. This size was selected because cherry and grape tomatoes, although high in soluble solids (measured in units of Brix), produce much less per plant in terms of pounds of fruit (1/3-1/2 that of beefsteak cultivars). In addition, market potential of cherry tomatoes is more limited than that of beefsteak types and harvest labor cost is higher. 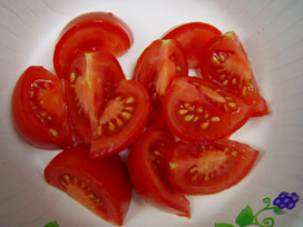 A colleague from Japan sent seed of ‘Momotaro’, which is grown in greenhouses there using special cultural practices to produce a high-sugar tomato. ‘Elegance’, ‘Diana’, ‘S630′, and ’67’ were recommended by seed companies for their superior flavor or sugar content. These cultivars were compared to ‘Trust’, which is grown on 85% of the North American greenhouse tomato acreage. 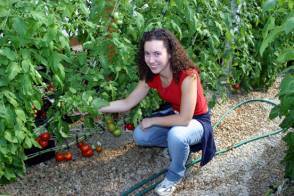 All work took place in project greenhouses at the Horticultural Field Laboratory in Raleigh, NC. Seeds were started in the fall and transplanted, 2 per pot, into “Bato” buckets containing perlite in November. Plants were assigned to one of two treatments: standard greenhouse tomato fertilization (EC ≈ 1.95 dSm-1 ) or high fertilization (EC ≈ 3.25 dSm-1). The same fertilizer was used in both treatments. There were 12 plants of each cultivar per treatment, and 6 replications. Treatments were initiated approximately 4 weeks after transplanting using a computerized irrigation system, the Harrow Fertigation Manager, to control fertilization. Irrigation was controlled by solar input to avoid over-or under-watering. Harvests took place twice a week beginning in February. All fruit was bagged by individual cluster and frozen for later analysis. Fruit weight, number, and blossom-end rot incidence were also recorded. These data have not yet been analyzed, but it is expected that yields of ‘Elegance’ and ‘Trust’ will be higher than that of the other cultivars. Taste tests were held March 4, 21, 25 and 26. Panels consisted of students enrolled in Greenhouse Vegetable production (Mar.4), SCP personnel and PI (Mar. 21) and the SCP Grower and Marketing Advisory Board (Mar. 25-26). The evaluation sheet was modified after the Mar. 21 testing on the advice of SCP personnel. We anticipate having an additional, larger taste test on campus in late April. 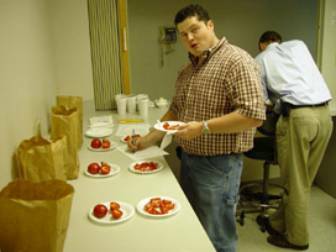 For this sampling we intend to include samples of field and greenhouse-grown tomatoes purchased in grocery stores as additional controls. Although there were some differences in preferences between the different panels, respondents consistently preferred cvs. ’67’, ‘Elegance’, and ‘Momotaro’ to the standard ‘Trust’ and to ‘Diana’. ‘S630’ was rated intermediate in some tests and low in others. Within a cultivar, high EC materials were usually rated higher than conventionally fertilized materials, but the trend was not strong. Overall, flavor was somewhat less sweet than anticipated, averaging 2-3 on a scale of 5. However, supermarket material was not included as a control, and unusually cloudy, cool conditions all winter undoubtedly reduced flavor. Most researchers have reported that Brix values increase later in the season as more sunlight is received. In previous experiments using lagoon effluent, we also saw an increase in Brix from April to June in both control and high EC materials. NC growers looking for a premium tomato and who can accept a smaller tomato should consider trying ’67’ and ‘Elegance’. ‘Elegance’ is particularly promising since in a preliminary analysis, yields were fairly high. However, additional research is needed before a high EC treatment of the type we used can be recommended. 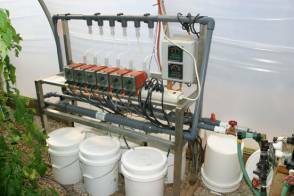 NaCl additions to the fertilizer solution have reportedly increased Brix and may be a better, as well as cheaper, way of increasing EC. Increasing the ratio of photosynthesis to transpiration is another possibility suggested by the literature, although the practicality of this remains to be demonstrated commercially. Another future avenue of research is to work with colleagues in Food Science to develop profiles of tomato flavor that will allow better prediction of consumer acceptance. Data from this project will be presented at the October meeting of the North Carolina Greenhouse Vegetable Growers and at the Southeastern Vegetable Expo next December. Tours to date have included the Greenhouse Vegetable Production class (15 students) and SCP personnel. We will recommend the cultivars that performed well in this study to growers looking for a small, high quality tomato.